You just have to take advantage of this summer's bounty--farmers' markets, fruits, veggies, sunshine, outdoors--see what your local area offers and use it as much as you can! Support Georgia Peaches. Michigan Cherries. Washington Apples. Maine Blueberries. Local Sweet Corn. Rainier Cherries. Apricots. Raspberries. Blackberries. Whatever! Wherever you are! Go for it! These crops are fresh, naturally sweet, bursting with vitamins, and delicious--so, don't settle for a lesser ingredient! 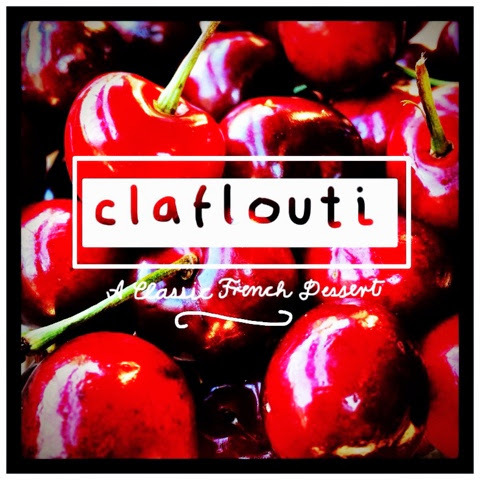 That said, I went and bought 2 lbs of cherries, strawberries, blueberries, raspberry, and decided I would post a refreshing, simple and classic French fruit dessert that's easy for any level cooking skill. Better yet, you almost always have the ingredients on hand! In fact, our son, Jon, made this as a high school student when he decided to pursue French as a second language--as a pot-luck party or class activity prior to heading to Paris that summer--that's how easy this recipe is!! This is like a combo of pancake, crepe, pudding with cherries--yep, pretty good! It' just one more option for summer fruit! The photos below don't necessarily include all steps, because I was not happy with the original recipe, so I went to the goddess of French Cooking, the infamous Julia Childs, and used her version. Note: raspberries, blueberries work equally as well especially if trying to avoid the hassle of prep! 2. Preheat your oven 350F degrees. 3. Butter your baking dish. 4. Combine the milk, 1/3 cup sugar, eggs, milk, vanilla, salt, and flour in a mixing bowl or blender. 5. Pour 1/4 inch layer of batter into your prepared dish. Set remainder aside. 6. Bake this layer for 7-9 minutes, just until it begins to set. 7. Prep your cherries while you wait (no pun intended)! 8. Remove from oven and sprinkle your cherries over the top. Leave the oven on! 9. Sprinkle cherries with the remaining 1/3 cup sugar. 10. Pour the remaining batter over the cherries. 11. Finish baking for 40 - 55 minutes until clafouti is puffed and brown. A knife should come out clean when inserted to the center. 12. Allow to set and cool slightly. Add your powdered sugar, a dollop of whipping cream, and serve warm. Enjoy summer! Enjoy friends! Enjoy sharing a meal!